Are you planning content-heavy projects, but find you don’t have the time or resources to execute them properly? Proofreading alone can take alot of time and expertise, let alone acquiring and managing all the necessary qualified authors. Does your website need search engine optimised content that will, above all, inspire and delight your readers? If so, take advantage of Textbroker Managed Service. Based on your requirements, we create a bespoke brief for your project and find the best authors for the topic, as well as doing all the required proofreading. With Managed Service, you receive exceptional content written exactly in line with your specifications. Best of all, you’ll have more time and resources to focus on your core business. Whether finding and managing authors, creating a brief, proofreading, or various other content-related tasks (i.e. image research or administrating your blog), book only the services required. All from a single source: Your personal contact person will manage the entire project on your behalf. Up to 36 languages available: Get your high-quality, unique content written by native speakers in the language of your choice, or use our translation service for any language in the world. Binding delivery date: We deliver your content on the day you specify, guaranteed. Ready to publish: You get finished content that you can publish right away. Do you require Content Marketing support? With years of experience in this field, Textbroker is an expert in delivering high-quality content. Whether you need blog posts, product descriptions, advice articles or social media content, with Managed Service you get relevant content that will meet your highest expectations. 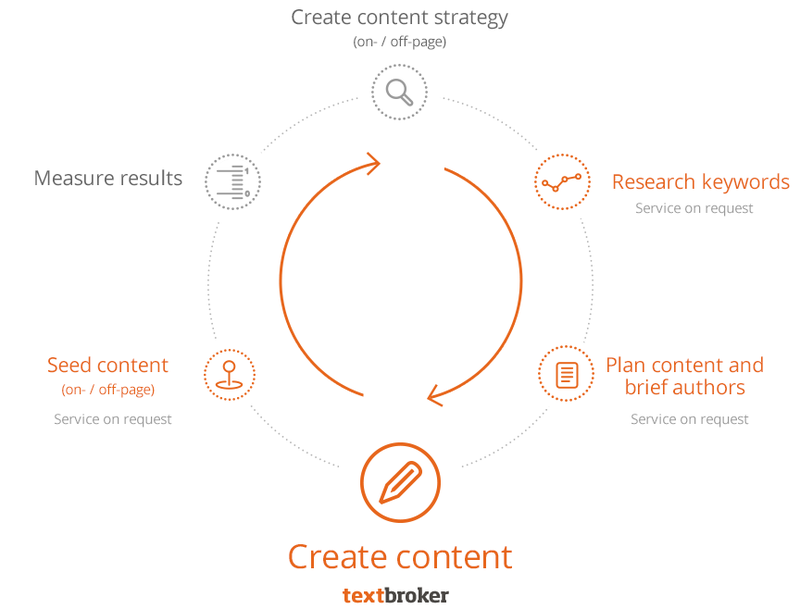 Textbroker offers additional content-related services, for example an analysis of your content needs, a list of relevant keywords for your project, or content seeding. With Managed Service you can rest easy knowing your project is in the care of the professionals. Allow yourself more time to focus on the core aspects of your business, and inspire your readers with high-quality content written by experts. With Textbroker’s Managed Service, you can get unique, high-quality content in 36 different languages, written by native speakers. You also have access to our translation service for every language in the world. You tell us the topic and your preferences – we deliver finished, high-quality content that you can publish the moment you get. For projects with a budget equal to or exceeding €500, Textbroker Managed Service provides you with high-quality, customized content. Click here to learn more about the terms of our Managed Service. As a pioneering figure among content providers, Textbroker has provided unique content since 2005. Have a read what our customers have to say about us here.